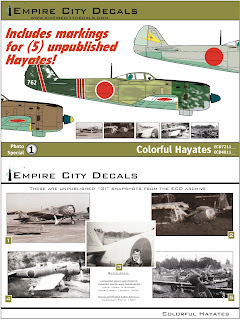 From Brian Weidemann of Empire City Decals comes news of a new set of decals for Colorful Hayates now available in both 1/48th and 1/72nd scales. This intriguing selection is based on unpublished photographs in Brian's collection. 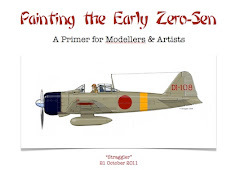 Very usefully the reference photos are included in the set which will allow modellers to interpret the schemes themselves if they wish to do so. 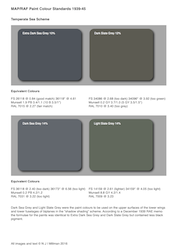 Schemes for Hayate models are limited with the same old favourites often seen again and again so this sheet is especially welcome. It is also pleasing to see the less well-known China-based 9th Sentai included. 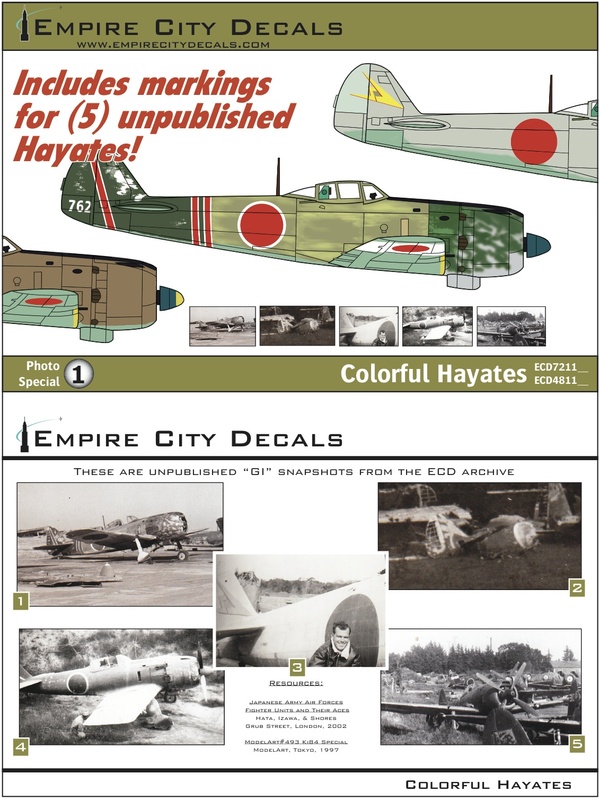 Several of their Hayate and Shoki aircraft ended up in Chinese Kuomintang markings as war trophies. A photograph of 9th Sentai Hayates has been shown before on this blog here. 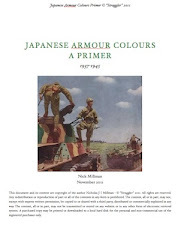 The 9th had been a Shoki equipped Sentai transferred from Manchuria into China during February 1944 as part of the preparations for the Ichi-Go offensive. Initially deployed to Hsinhsiang to provide air defence it was noted that the unit only had about 10 aircraft on strength. At the time this unit was under direct Army command. 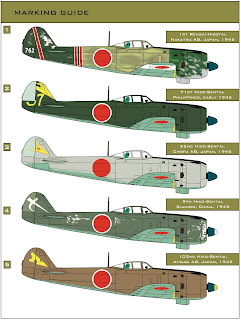 By May 1944 the strength of the unit had risen to 11 Ki-43 Hayabusa and 14 Ki-44 Shoki aircraft. 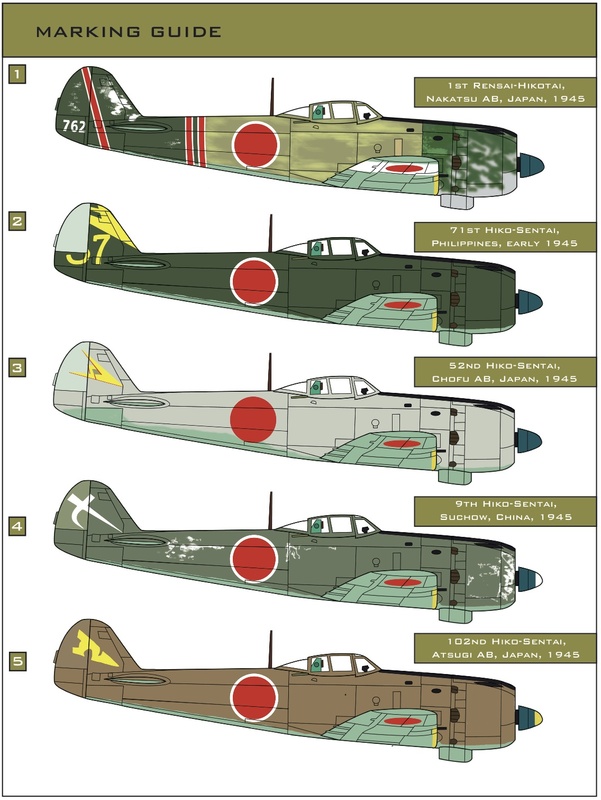 On June 11th 1944 the 9th suffered at the hands of the 449th Fighter Squadron (P-38) over Anking, losing Captain Michio Iwata the 1st Chutai leader and Sergeant Kazuyasu Kamidozono. On June 13th 1944 the unit lost Sergeant Kazuo Miyasaki to the guns of another 449th P-38. At the end of August 1944 the 9th had only 6 officer pilots against its authorised strength of 13, 5 rated ‘A’ and 1 rated ‘B’. However the unit fielded all of the 30 authorised WO & NCO pilots, with 6 rated ‘A’, 4 rated ‘B’ and 20 rated ‘C’. 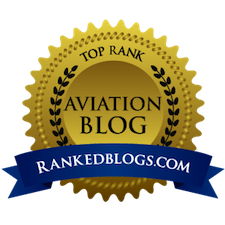 These ratings were based on the number of operational flying hours attained by each pilot. One of the least experienced units in China, the figures were reflected by its rather undistinguished combat record, although the unit had some success against the early B-29 operations. 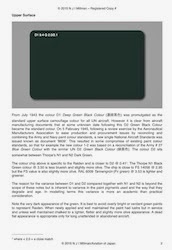 By November 1944 the 9th was still at Hsinhsiang but now under command of the 8th Air Brigade with a three-fold mission to engage in decisive air battles, to protect vessels on the Yangtze River from Hsiaochikou to the vicinity of Hankow and for the air defence of the Wuhan area. From November 1944 onwards the unit operated from Canton, moving to Nanyuan airfield near Peking in March 1945 and finally ending the war at Nanking (Nan Jing) and Suchow (Su Zhou) where its abandoned Ki-44 and Ki-84 fighters were seized by the Republic of China Air Force. With the steady attrition of its experienced pilots one of its most disastrous days came over the Tien Ho and White Cloud airfields at Canton on December 27th 1944 with the loss of 5 pilots; Major Takehisa Yakuyama the Sentai commander, Sergeant-Major Tokusaburo Nakagawa, Sergeant Katsuji Kato, Corporal Kuniji Torizuka and Captain Eiji Yuzuki the 1st Chutai leader were all killed in action. The victories were claimed by the 74th Fighter and 118th Reconnaisance Squadrons. 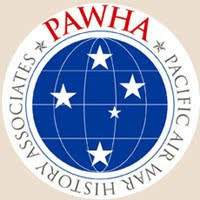 The most notable flyer in the 9th was Lieutenant Yoshitaro Yoshioka who had the dubious distinction of force-landing a Ki-44 without power twice, a notoriously difficult feat. On the second occasion, on July 22nd 1944 he was badly injured and lucky to survive. After the death of Major Yakuyama on December 27th 1944 Yoshioka led the unit, surviving the war. He remained in China for a time after the war, training Chinese pilots to fly the Ki-84. In China he had claimed only 6 aerial victories. According to Minoru Akimoto the Sentai insignia was an abstract design combining the historical spear used by the warrior Kiyomasa Kato during Japan’s invasion of Korea in 1596 and the character ‘Na’ representing the unit’s first commander Lieutenant-Colonel Seisaku Namba, painted across the fin and rudder in the Chutai colours of white, red or yellow. The Sentai Headquarters Flight (Sentai Hombu) displayed the design in blue. According to Katsushi Owaki the marking was designed from the Kanji charactor for the number "9"(九).